While I am by no means the girl who can spend $50 on an eyeshadow palette, I still love a great product. Just at a lesser price. 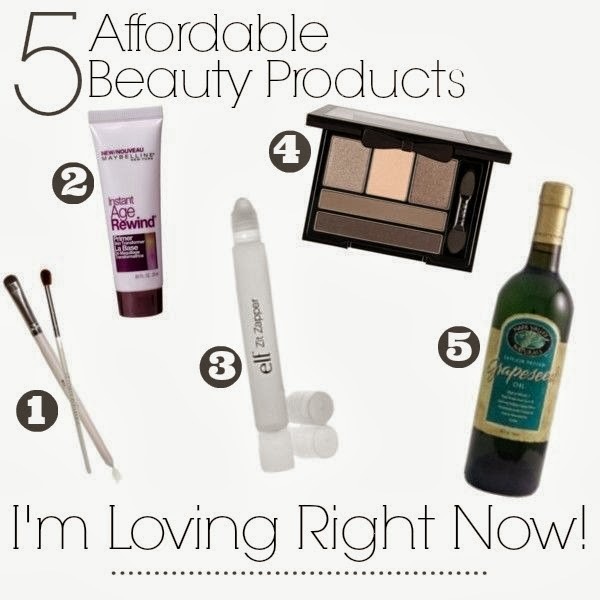 Today I'm sharing 5 of my current loves that I use every single day! 1. e.l.f. Makeup Brushes - For the longest time I seriously thought I only needed a plain Jane makeup brush, well recently I splurged (a whole $1) and bought a few from e.l.f.. Let me tell you, it's worth it. I don't like spending $7 on multiple brushes, but a dollar I can handle. I happened upon mine at Target. 2. Maybelline AgeRewind Primer - I've had this little diddy sitting in my makeup bag for ages, completely unsure what to do with it. I watched videos, but just didn't get the results I thought I would get. Well, for the past few months I've been using a little pea sized dollop of it on my eyes before I even apply my beloved B.B. Cream. It helps my eye makeup stay all day... and the best part is when I go to remove my makeup at night it comes off much easier. Serious, in the past my eye makeup basically stained my eyelids, not anymore. 3. e.l.f. Zit Zapper - I've used Clinique and Proactive forever, but this is my new favorite (it was either $2 or $3 at Target). It's carries easy, and fits great in my purse! The best part though, I had one of those awful oily breakouts on the crease around my mouth this week, I put some of this on twice during the day and when I got home from work the breakout was no longer swollen and gross. It was a little red, but all the swelling you get with those awful hormonal oily breakout had vanished. 4. NYX Love in Florence - Meet My Romeo - While I won't spend the money on a Naked palette, NYX is definitely catching onto the Urban Decay trend with the Meet My Romeo eyeshadow. I've mainly been using the top 3, the others are too dark for work and church, but they seriously stay on and have great color. NYX has seriously impressed me.